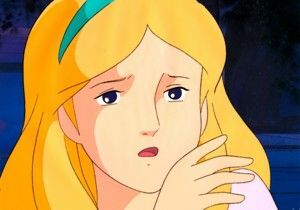 Grimm Masterpiece Theatre: Briar Rose Pricks Her Finger (uploaded 5/14/2009). 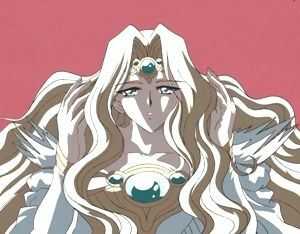 Inuyasha, Ep. 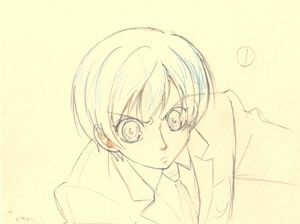 158: Kohaku confronts His Sister (Rough sketch by Shouko Ikeda, uploaded 5/14/2009). Welcome to my collection of animation art! As you'll see, I take a "museum" approach, annotating the items I collect, putting them in context whenever possible, and providing background information on the series and the creators. This site is an opportunity to learn more about the artistic process behind animation. 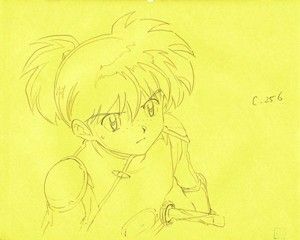 So in addition to beautiful cels, you'll see some of the production materials--sketches, backgrounds, settei, storyboards, "test" cels--that let us look behind the scenes at how animation studios produced these series. If you're not sure where to start, begin with one of the "Quick Gallery Tours." Now divided into three categories -- Golden Age, Classic Cel-Based, and Contemporary CGI-Based -- they give a picture of the whole collection at a glance, and then review each series I collect, one page per series, with a lot of links to the individual galleries as you go. And if you're a real lover of animation art, then go to "Private Area" and type in the super-secret password "seemorestuff" to gain access to lots of extras that I've hidden to keep the gallery easy to explore. 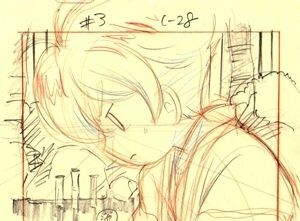 The banner adapts a rough sketch from Ep. 25 ofSasami: Mahou Shoujo Club, showing Sasami being confronted by her idol Amitav. The background is a detail from a draft art board for Ep. 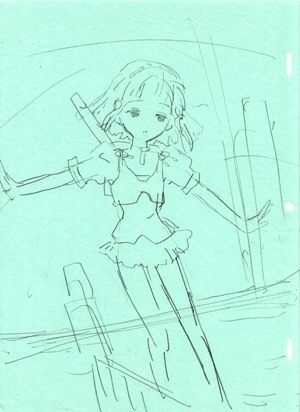 12 of J. C. Staff's Asatte no Houkou (a fuller scan with notes will be part of this year's "May Madness" update).